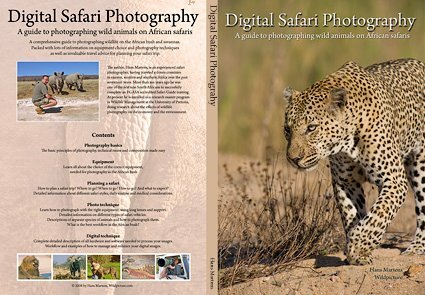 Digital Safari Photography is a guide to photographing wild animals on African safaris. This large A4 sized book contains 150 full color pages with nearly 300 images and many more diagrams and screen prints. The book starts with an introductionary chapter about photography basics. The second chapter is all about equipment, emphasizing on which cameras and lenses to select specifically for safari photography. All other equipment, ranging from window mounts and beanbags to computers and external hard drives, is also described in detail. The focus is on its practical usefulness in the African wilderness. Chapter three is aimed at preparing for a safari trip and describes all the different types of safari trips and things like daily routine and medical considerations. The biggest chapter of the book is about the photography techniques in the field. It describes how to best use your equipment and how to work from the different types of safari vehicles. There are descriptions of the main animal species you will encounter on a safari trip and how to photograph them. The final chapter is about post processing and digital enhancement of your images after the trip, concentrating on hardware, software and workflow.